Break up one of the cinnamon sticks into a few pieces and place into saucepan or pot. Add apple cider and spiced rum and heat over low heat until bubbles begin to form on top (do not bring to boil). Remove from heat to cool. Cut a few strips of the licorice rope for the spider legs. Make sure they’re long enough to reach the rim of either a heat-resistant mug or mason jar. Criss-cross them and position under the belly of the spider body. Using the other cinnamon stick, cut the top so that it has some spikes at the top (but still long enough to stand in the drinking glass) and attach the candy spider. Make sure to apply enough pressure so that it is securely attached. If the spider body starts to split in half, simply squish it back together. Fill your mug or mason jar with the warm spiced spider and place your spider cinnamon stick so that the legs can balance on the rim. Serve immediately to your guests and enjoy! Want to make your guests really squirm? Try serving a Creepy-Crawly Spider Cider at your Halloween Bash! One of my favorite Fall drinks is a hot apple cider with a little spiced rum. I love the combo of the spicy rum and cider sweetness. It's even better when you can dress it up for your Halloween festivities and give your guests something to squirm over while they sip. A Creepy-Crawly Spider Cider will make spines tingle for all the right reasons! The cider recipe itself is easy enough. You want to make sure to use long pieces of cinnamon sticks. Most stores will sell decorative ones that are about 6 inches long. Break up one into a few pieces for the drink, and save the others to make your spider stick. Heat the apple cider in a saucepan or pot with a few cinnamon stick pieces and spiced rum over low heat until bubbles begin to form on top (do not bring to boil). Remove from heat to cool. While this is cooling, start making your spider stir stick. For this recipe, I chose the licorice pieces from Chuckles candy for the spider body and black rope licorice for the legs. However, Chuckles can be a little hard to find (I found mine in a specialty candy store) and you have to buy a lot to get that one piece. So you can always substitute large black licorice gum drops for the body as well. Next, cut a few strips of the licorice rope for the legs. Make sure they're long enough to reach the rim of either a heat-resistant mug or mason jar. Criss-cross them and position under the "belly" of the spider body. 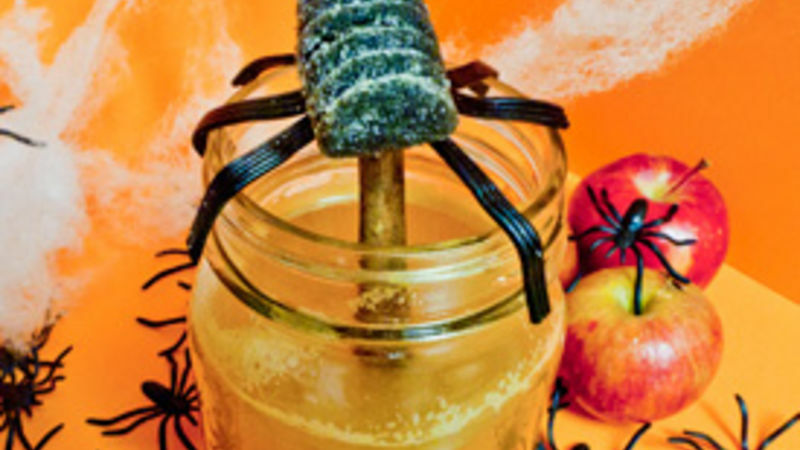 Using a long cinnamon stick, cut the top so that it has some spikes at the top and attach the candy spider. Make sure to apply enough pressure so that it is securely attached. If the spider body starts to split in half, simply squish it back together. Fill your mug or mason jar with the warm spiced spider and place your spider cinnamon stick so that the legs can balance on the rim. Serve immediately to your guests and watch the squirming begin! Now, obviously, this drink is not for the kiddos. However, you can easily make and serve sans the spiced rum and still have a delicious drink.